Are we tired of turkey yet? Good. We should be. That means we’ve been cooking abundantly with a nutritious, seasonal food, just as cooks have been doing throughout human history. The difference is, we have freezers now, so we don’t actually have to eat turkey for days or weeks in a row in order to be economical and health conscious cooks. After making three turkey soups, turkey Stromboli, and turkey bread pockets, you should still have a little bit of turkey left. Pull it out of your freezer some night, let it thaw in your refrigerator, and make this simple salad for lunch! Combine all ingredients except for spinach leaves. Toss with a fork until well combined. 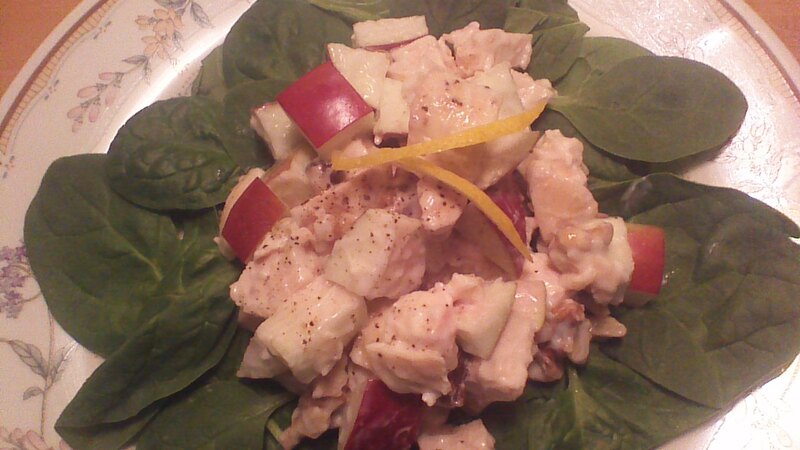 Arrange turkey mixture over a bed of spinach leaves. Sprinkle with salt and pepper, and garnish with lemon peel. Done! I hope you’ve enjoyed saving money and stocking your freezer with our Six Meals from a $6 Turkey series! Next time on Crowded Earth Kitchen… dessert! This entry was posted in Soups and Salads and tagged Cooking, Food, salad, Turkey. Bookmark the permalink. These will come in handy during the holidays. Thank you for sharing!